Our PVC Jane Mills is pleased to announce the appointment of three Associate Deans Pasifika for the College. Dr Faleolo will focus on community engagement, Dr Firestone on recruitment and Dr Mafile’o on Pacific student success. We would like to thank them for their commitment to the College and our Pasifika communities and look forward to working with them. A simpler means of cancer diagnosis and monitoring, using small fragments of tumour DNA circulating in the bloodstream, could be a lifeline for Pacific patients in particular. Dr Dianne Sika-Paotonu, Associate Dean (Pacific) at the University of Otago, Wellington, has just been awarded a Pacific Health Research Career Development Award by the Health Research Council of New Zealand (HRC). With her $195,162 Sir Thomas Davis Te Patu Kite Rangi Ariki Fellowship, she will investigate the potential use of a simple blood test to identify circulating tumour DNA (ctDNA) for the purpose of detecting cancer at an earlier stage. Circulating tumour DNA (ctDNA) refers to small fragments of tumour DNA found in the blood circulation, recognised by the presence of mutations in cancer genes. Work in New Zealand led by Professor Parry Guilford, and supported by the Healthier Lives National Science Challenge, has demonstrated that these DNA fragments can be isolated and quantified to obtain information about a cancer's size and progression – so they can tell us how a tumour is behaving. Dr Sika-Paotonu says there are also indications that ctDNA technology could be extended to develop a simple blood test to detect cancer, which does not require a hospital visit. This will enhance the precision of cancer diagnostics and surveillance, and lead to improved health outcomes for Pacific people by allowing earlier diagnosis and treatment. Tumours are usually picked up using biopsies, but Dr Sika-Paotonu says this can be a significant barrier to care in Pacific countries where access to healthcare is limited and the cancer burden is growing. "Sometimes it’s not that easy to get to a tumour and take a biopsy. Most biopsies will require some level of surgical intervention, so that compared to a blood test is a very striking difference,” she says. "Instead of using ctDNA technology to only monitor treatment progress, we're trying to target the beginning stages and detect cancer at a much earlier time-point when it is more likely to be treated successfully." While development work in this area is still required, Dr Sika-Paotonu will explore the applicability of this potential technology in resource-constrained environments. Diagnostic methods are difficult to access in the Pacific region and treatment options are limited and expensive, she says. Often cancer is picked up late and palliative care becomes the only remaining option for many people. The HRC has supported Dr Sika-Paotonu on a number of research projects to date, where she’s developed her strengths and commitment to reducing health inequities. The HRC’s manager of Pacific Research Investment, Tolotea Lanumata, says it’s important to support biomedical researchers who explore problems and solutions in partnership with those they’re trying to help. The HRC today announced 22 Pacific Career Development Awards worth $1,548,043. See below for the full list of recipients. A Victoria University of Wellington researcher hopes to improve the success of a fertility treatment that’s rarely used in New Zealand but may potentially provide a safer alternative to current artificial reproductive technologies (ART). Matire Ward of Te Matarahurahu hapū and Te Kotahitanga Marae in Kaikohe has just been granted a Māori Health Research PhD Scholarship, valued at $113,791, in the Health Research Council of New Zealand’s 2019 Career Development Awards. She will be working under the supervision of Dr Janet Pitman, who focuses on factors that make a good egg. Ward aims to improve the process of in vitro maturation (IVM), in which eggs are retrieved while still at an immature stage and brought to maturity in the laboratory (in vitro). The process differs from conventional in vitro fertilisation (IVF) which utilises medications to bring a patient’s eggs to maturity before they are removed from the ovary. Ward claims that IVM is safer than conventional IVF as the treatment doesn’t rely on ovarian stimulation which may result in ovarian hyperstimulation syndrome (where ovaries become swollen and painful). However, the use of IVM in fertility clinics remains controversial due to the reduced quality of embryos derived from in vitro matured eggs. For this reason, the practice is still rare in New Zealand, with the first baby only conceived in 2013. "The main issue is that current IVM methods produce lower-quality embryos. We're taking an immature egg from its natural environment and putting it in this foreign environment in the lab," says Ward. The secret to improving the treatment’s success could be in mimicking, within a Petri dish, the natural physical environment of ovarian follicles in which eggs would normally mature, she says. As a follicle matures, an area within it fills with fluid, says Ward. The nutrients, including glucose, carbohydrates, hormones, and growth factors present in this fluid are transferred to the egg by its surrounding support cells. This transfer is critical for optimal egg development and maturation. When cells are cultured in a dish in the lab, these nutrients are provided at concentrations very different to what is found in follicular fluid. Using cow’s eggs for her investigations, Ward will prepare and test nutrients at concentrations similar to that of follicular fluid. She will then investigate the key molecular and metabolic pathways that are altered when immature eggs are exposed to these nutrients, in order to develop an improved IVM system that produces high-quality embryos. Ward says refining this therapy may give another treatment option to couples concerned about, or at risk of, hyperstimulation syndrome. She also aims to have conversations with Māori about the use of ART and how her research might mitigate commonly-held concerns about fertility treatments. “While Māori opinion on these types of therapies is conservative, it’s of upmost importance to all Māori people that their whakapapa is continued in a way that regards tikanga,” she adds. Matire Ward is one of 19 researchers to receive a 2019 HRC Māori Health Research Career Development Award. Mr Stacey Pene, the HRC’s senior manager of Māori Health Research Investment, says these Awards are key to building capacity and capability within the Māori research workforce. “Māori researchers are tackling complex scientific questions and public health issues that will improve Māori health and wellbeing, and benefit New Zealand as a whole. We’re incredibly proud to support researchers who are making a significant contribution to knowledge and a genuine difference to their communities,” he says. See below for the full list of recipients, and click here for lay summaries. There are battlers for the Māori language in many corners of the country — but maybe none more persistent or productive than Cathy Moana Dewes. Since 1985, when she set up Te Kura Kaupapa Māori o Ruamata, a few miles out of Rotorua, Cathy has been, among other things, the principal of a school that has produced generations of speakers and achievers. For her, it’s been a battle to “reclaim the language of the Māori soul”. Her talents and energy were recognised early on when she was head girl at Wellington Girls’ College, and the winner there of an award for all round excellence. There have been other honours since then, including an honorary doctorate from Waikato University and being made an Officer of the New Zealand Order of Merit for her services to Māori. Here she is with Dale, looking back on the path she’s been travelling. Kia ora, Cathy. You’ve been making a big impact in Māori education for many years now, but I suppose it’s not at all surprising that teaching is the path you’ve taken given that both your parents, Koro and Kura, were teachers — your dad from Ngāti Porou and your mum from Te Arawa. Yes, I’m the product of a marriage between Koro Te Kapunga Matemoana Dewes, who’s Ngāti Porou, and Parekura Thelma Raureti, from Te Arawa. On my Ngāti Porou side, I have strong relationships with the Korohina and Rangihuna whānau from Te Araroa. My Ngāti Porou ancestors were involved in all kinds of struggle, for land and for mana wāhine rights. The struggle for land then became a struggle for language and culture, which my dad picked up — and that has greatly influenced the direction I’ve chosen for my life. Koro and Kura Dewes, from their Ardmore Teachers’ College days. Mum is a descendant of Raureti Mokonuiarangi, who was a leader for Ngāti Rangitihi, especially in health, mana, mātauranga Māori and land rights in Te Arawa. He was a Māori Land Court interpreter, highly literate in both Māori and English. His wife, Te Aoerere, was from Mokoia Island. It was Te Aoerere’s people who decreed that the children of Mokoia must attend school five days a week, so they dismantled and rebuilt a house on the mainland in order that the children were indeed able to do that. I have very strong family associations with both these whakapapa on my Ngāti Porou and Te Arawa sides. And, through these links, I’ve learned my rights and my responsibilities for my people. I also have a Pākehā side. My mother’s mother is of Welsh, Irish, Scottish and English descent. And, of course, my Dewes ancestor is of English descent. That Pākehā mix, I think, has contributed to my understanding of what I see as basic human rights and values. People, no matter what their descent or ethnic origin, have a right to live their lives with respect, with dignity, and to be true to the culture to which they belong. I’ve chosen the Māori culture, as opposed to my Pākehā heritage, to be the dominant, identifying factor in my life. And the English and European mix in my bloodlines has assisted in affirming and confirming that commitment to my Māori language and culture. And you’re right, teaching is in my blood, it’s strongly imprinted in my genes. Dad taught at Ruatoki, Tikitiki, St Stephen’s, Auckland University, and Victoria. Mum taught at various primary schools during her career, including Tikitiki, Bombay, Mt Roskill, Karori Normal, and Rerekohu. The Dewes family in 1972. From left: Cathy with Te Kapunga, Kura, Koro, and brothers Whai and Campbell. You’re a wonderful advocate for our reo. How did that come about? As a pre-schooler, I was exposed to te reo in the community. The Māori language was everywhere in Rangitukia and Tikitiki, where my parents were teaching. It wasn’t in my home between Mum and Dad, but it was everywhere else. 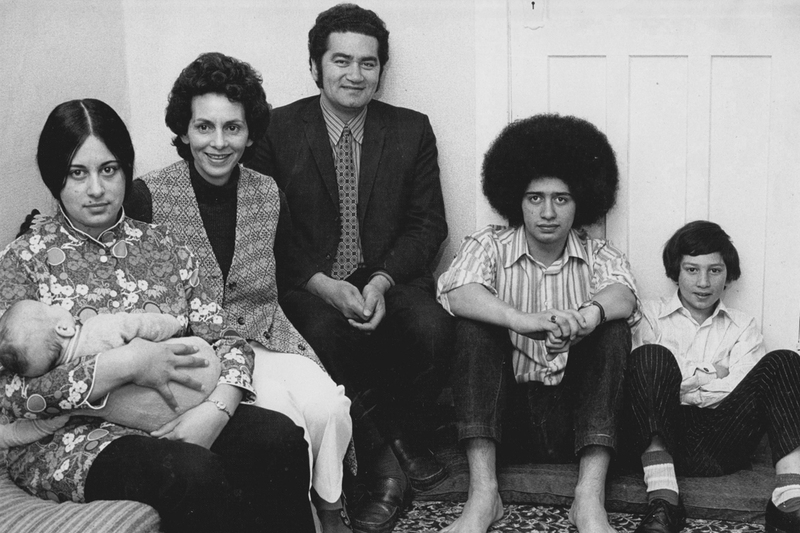 Often there were family and friends in our home and Dad would be speaking Māori with them. He coached rugby and there was lots of interaction with Māori people. So I got to hear the reo and acquire some of the language, even though it wasn’t consciously taught or spoken at home. In my early years, I spent some time in Matatā as well, where there was no reo Māori in my immediate environment. Then we moved to Bombay. Dad was a teacher at Tipene (St Stephen’s) and Mum taught at Bombay Primary, where I went to school. That was a total Pākehā model of education. I didn’t even consider that Bombay might’ve had a Māori name before they named it Bombay. It never occurred to me that there was a Māori history and that Māori people might’ve been part of that landscape sometime in the past. So I got to experience first-hand the results of colonial imposition of the white man’s standards. Our home environment at St Stephen’s did include some Māori interaction with other teachers. 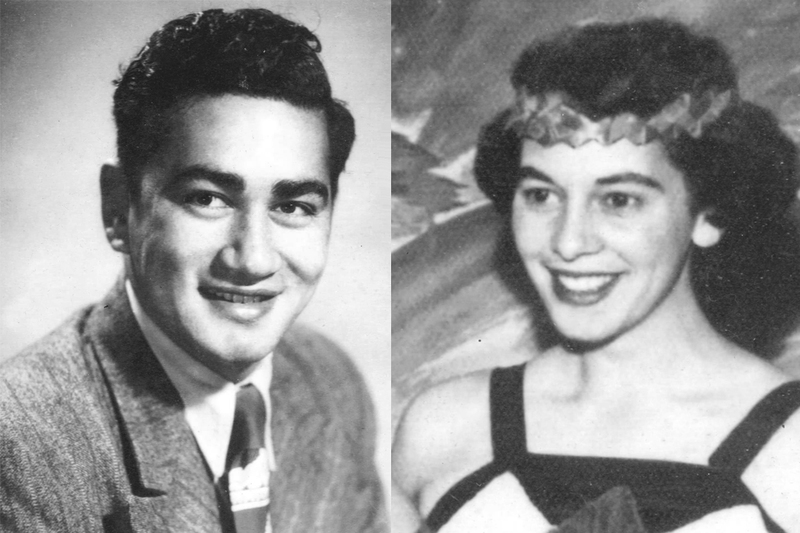 Like Ra and Tangi Ihaka, Scotty and Betty McPherson, George and Pare Marsden. But it wasn’t a major factor for me during the three years we lived there. It wasn’t until Dad landed a job at Victoria University that I began to embrace te reo Māori. There, I’d hear him talking and joking with his mates, having down-time together. And there were formal occasions, too, like with the graduates’ association. That’s when I came to hear the issues that were, and still are, facing Māori. At that time, the big issue was establishing a chair of Māori language at Victoria University. Koro, Cathy, Whai in the back. Te Kapunga, Kura, and Campbell in the front row. By then, you must’ve been at high school. Yes, I was. And, as a seventh former at Wellington Girls’ College, I had plenty of free study time. I was doing lots of languages — French, German, Italian and Latin as well as English. And I was doing Indonesian after school just out of interest. But Māori wasn’t being taught. So I went to the principal and asked her if I could study Māori through the Correspondence School. I said I’d use my free time to do that. However, she said “no”. And that had me feeling a mixture of frustration, perhaps rage, and indignation that this old Pākehā woman would have so much power over me. When I went to Victoria University, I became very active politically in the struggle that Dad had already started. That was to make a space for Māori language within the university environment. And I began learning Māori with Dad as my lecturer. Then I and my fellow students decided that, as part of the struggle to make a space for te reo Māori within the university, and in this world, we needed to become fluent speakers of Māori. And the only way we’d be able to do that was to speak Māori to one another. We set up a sort of club and called ourselves Te Reo Māori Society. One aspect of our constitution was to politicise te reo Māori, and the other was to get together every week and practise speaking Māori to improve our conversational Māori. At the same time, we were learning formally in classes conducted by Dad. I’m really grateful for the intelligence my father applied to his teaching methodology. He impressed upon me the importance of learning by listening. That’s largely, he said, how we acquire the language, given that 80 percent of what we learn is acquired. It’s caught rather than taught. He also exposed us to some great exponents of te reo Māori and some great minds from within the Māori world. Great thinkers like Māori Marsden, Arnold Reedy, Te Ouenuku Rene, Eruera and Amiria Stirling, and Pine Taiapa. He pulled them in so we could hear both the language and the knowledge from these experts, these carriers of the treasures of the people. And we got to sit at their feet and hear their talk. Have you been back to Vic since you graduated? As a matter of fact, last year I was asked to go back to Victoria University on Māori Language Day and tell the students about my reo journey. I told them that one of my favourite songs during that time was Nina Simone’s To be Young, Gifted and Black. The words of that song are just so true. And the one line I really, really like, and talk about a lot within the Aho Matua schooling model, is this: “When you’re young, gifted and black, your soul’s intact”. That puts the focus on spiritual development, cultivating our Māori language and identity, creating a space for soul to be alive and well in our society. One thing I’ve noted and admire about you, Cathy, is that you stand your ground — whether that’s as a schoolgirl at Wellington College, or with Te Reo Society, fronting up to parliament, or speaking on the marae. Were you something of a radical in your youth? Yes. And I still am. Recently, I’ve been cleaning up files and what-not, and found papers eaten by silverfish and mildewed because they got wet. And I’ve found letters, which I’d totally forgotten about, between me and Hana Te Hemara, leading up to the presentation, in 1972, of the Māori Language petition, where she was telling me what she was doing in Auckland and suggesting what we might do in Wellington. I actually didn’t attend the presentation on the steps of Parliament Buildings because I had a six-week-old baby and I didn’t want to take him out in the cold because I didn’t know how long it was going to take. So he and I and my younger brother Campbell stayed at the Ngāti Poneke hall and prepared lunch for the group when they finished the presentation. After that, of course, there were the submissions to prepare for Māori Language Day, Māori Language Week, and broadcasting. I’ve got copies of correspondence between Te Huinga Rangatahi, Te Reo Māori Society, the Māori Affairs Department, and so on. Hekia Parata was our Huinga Rangatahi chair and she led us, in a special delegation, to Kara Puketapu, who was the Secretary for Māori Affairs. And we said: “Look. We found a clause in the Māori Affairs Act which gives you authority to actively promote te reo Māori. Here it is.” And we showed him the clause. Then you were part of the action that led to reo Māori getting its foot, or its toe anyway, into television. Yes, I vividly recall meetings with various people where we were working out a strategy to get five minutes of daily news in Māori on prime-time viewing. This eventually became Te Karere. I remember meeting with an expert from the BBC who advised us that, if we were going to focus on Māori within broadcasting, we needed to train the Māori who were going to do it. So we advocated and won a training programme for producers and directors. Robert Pouwhare, Lee Tamahori, and Brian McDonald were part of the first intake who went on to become producers and directors. But there were untold submissions. Honestly, Dale, too many submissions. I had submissions coming out of my eyeballs. Hundreds of thousands of words written to persuade the powers that be, the decision-makers, that we have a right to our language within our society. So I’ve been in the struggle for 50 years. It started when I was 17. Someone said to me: “You should write your biography.” But I don’t want to do that. I don’t have the time. Why should I tell my story? What we need to do is concentrate on winning the war. Well, there is a story to be told. A chain of significant events — the civil rights movement, the struggle for Māori identity, the Land March, the challenge for broadcasting, setting up the kōhanga reo and kura. And they’ve needed champions such as your dad. Koro was a champion and you’ve followed in his footsteps. So you shouldn’t feel embarrassed about attention being on you. Or about people wanting you to write a book. Well, anyway, when the suggestion came that I should write my story, I thought: “Nah”. Then, if I was going to write something about myself, I began wondering what I’d call it. But I’m not sure the written word would convey the spirit of that question. It’s just that it’s 50 years on in the battle for the reo, and we’re pretty much still in the same hole. And WTF captures the depth of my frustration. Cathy (centre, back), her children, brothers, and other whānau, on the steps of Parliament Buildings. 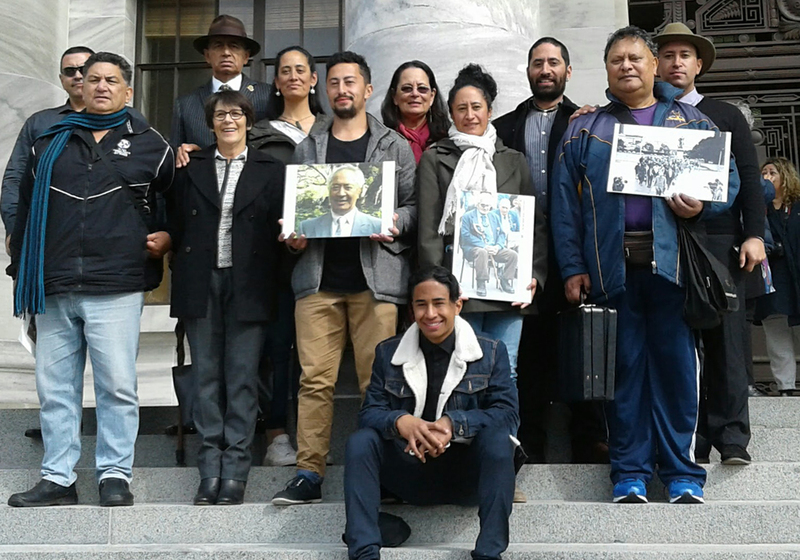 Youngest son Morehu is holding a photo of his father Rawiri, eldest daughter Pirihita is holding a photo of Koro Dewes, and cousin Thomas Rangihuna is holding the now famous “Hana’s petition to Parliament” photo with Te Ouenuku Rene leading the way. We’re making progress, though, aren’t we, Cathy? It’s true that there’s a long way to go, but there’ve been significant changes during your working life. Now let’s talk about Te Kura Kaupapa Māori o Ruamata. Just past the Rotorua Airport. A school that you set up and have led and guided for over 30 years. I’m sure you’ve had great satisfaction from that. It’s been a wonderful achievement. Yes, it has been satisfying. In my Ruamata community, we now have four generations of Māori speakers who started with nothing. With no reo. And that success is something we can hold up for the world to see. But we should recognise that a key player in the success has been the Ataarangi teaching method. The Ataarangi movement is greatly undervalued but it can create communities of Māori speakers. We need to keep supporting and resourcing Ataarangi because it’s a tool that can help all of us. You and I can go to university and learn Māori there. And that’s fine for us. But the majority of our population don’t go to university. We don’t like school. Whereas Ataarangi can take the language to all our people, including the academics, lawyers, corporate staff, and the teachers. It can teach the language to anyone, including Pākehā. It’s an essential tool in learning the language. And it’s greatly undervalued. Unfortunately, only a small percentage of our Māori kids are at kura kaupapa. Even so, the kura are very important, especially for their leadership role. But I imagine there are challenges for these schools. You may not be aware, Dale, but a couple of years ago when National was in power and had Hekia Parata was the Minister of Education, she turned off the funding for our national organisation, Te Rūnanga Nui. That’s because, as a movement, we were refusing to send in assessment data. At that time, many of my Aho Matua whānau wanted all-out war and I had to use all my persuasive power to pull us back. To hold our ranks! We’ve been saying since 1989 — when Tuki Nepe, Pita Sharples, Graham Smith, Rahera Shortland, Tony Waho, Katerina Mataira, and I debated and wrote the working party report on Kura Kaupapa Māori — that we need our own curriculum and assessment practices and processes. We know that to be the truth. We want by Māori for Māori. We are a tino rangatiratanga model of education. We have a Treaty and a basic human right to our unique schooling type. So we stood our ground and have been trying to persuade the government that they need to resource us. We have our own experts, and we can debate, research, and design our own assessment processes and everything else that a Māori education which derives from mātauranga Māori would entail. But it’s been a struggle for years. Hopefully, this new government is going to support our case and acknowledge that our Te Aho Matua curriculum should be recognised as a bona fide curriculum of Aotearoa. We had considered suing the previous minister, but we dropped that idea and instead we pitched our sights on the 2017 election and the Labour Party promise to dump national standards. We were very happy when they won the election. And now we’re awaiting a significant change which ought to accommodate our very unique approach to assessment. Let’s turn now to another issue where you’ve been active and forthright. That’s the role of wāhine in politics, including tribal politics. I assume that it’s inevitable that there’ll be more and more change and that the day is coming when there’ll be a thumbs-up all around for women to be speaking on the marae? The men tell us women here in Te Arawa that they’re concerned for our health and wellbeing and our exposure to mākutu, if we stand on the marae. But we need to assure the women that we’ve got ways to protect ourselves if there’s a real threat that the men are going to point the bone at us. When that threat was made to me, when I was standing for the Arawa trust board, I was very quickly on the phone to my dad to ask what I should do. He gave me an appropriate karakia. I also rang Katerina Mataira and she gave me a daily ritual to protect myself and my family. Having an ure shouldn’t be a factor in entitling people to stand on the marae. And we know that, in Ngāti Porou, in Kahungunu, and in the north, women are able to speak on the marae. But women need to come forward and do that. And then Te Arawa and Tūhoe and others will see the examples and follow suit. But it may be that it won’t be until my daughters’ generation that we make the change. 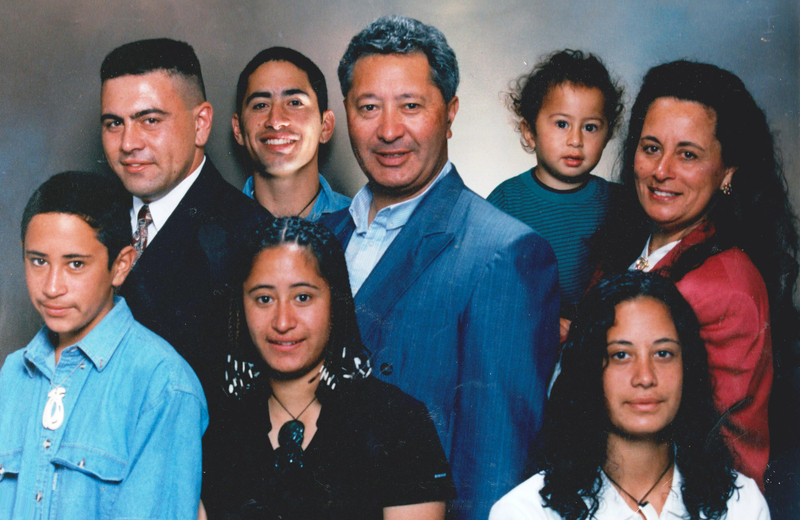 Cathy and Rawiri Rangitauira with their six children. Front row, from left: Tenga, Pirihita, Parekura. Back: Te Kapunga, Kanapu, Morehu. Meanwhile, what personal goals do you have, Cathy? What have you set for yourself in the years ahead? So I was ready to go. But then I was persuaded that I needed to think about my children and grandchildren before I moved across to the other side. So I thought I’d give them another 21 years, and then I’ll go. My challenge now is just to continue to support the growth of kura Aho Matua and keep promoting the value of Ataarangi. That’s how we’ll get the quantity and the quality of Māori speakers who are Māori in every way. And by the way, Dale, my fourteenth moko is taking Māori as an NCEA Level 1 subject this year. That’s what Hana Te Hemara’s petition was all about. Offering Māori as an optional subject in all high schools where Māori were a significant proportion of the school roll. We have what we call Poutiria Te Reo Mauriora, which is a vision of kōhanga, kura, wharekura and wānanga — all part of one community, with one governing body. That’s a major project that we’re now working on. Our goal is that all Māori children should have access to their language and be able to live as Māori within Aotearoa. We have a right to be Māori in Aotearoa. That’s the ultimate goal. And, of course, there are short-term goals and political processes in order to achieve that. We have a right to be Māori in our own land. Consultation is now underway into New Zealand's first set of health research priorities. This is an opportunity for all New Zealanders to have their say on the direction and focus of health research for the next 10 years. Please contact Dr Alexandra Boyle at aboyle@hrc.govt.nz to register your interest in attending. If the cost of travel to attend a meeting is a concern, do let us know. The consultation process is aimed at being as inclusive as possible. We are interested in hearing from health researchers, community organisations, NGOs, consumers, clinicians and allied health professionals, research funders and other government agencies. For background information about the consultation and the priority-setting process, head to the HRC's consultation page. The name of the research centre has been gifted to Ngāti Porou Hauora by the whānau of the late Dr Paratene Ngata. The name honours his vision for Ngāti Porou Hauora to become a “tikanga and research-based centre of excellence for Hauora Māori”. In English, Te Rangawairua ō Paratene means ‘The Inspiration of Paratene Ngata’. The centre will provide a basis for building on the research initiatives and relationships which Dr Paratene inspired Ngāti Porou Hauora, our communities and a wide range of university researchers to become involved in over the last 15 years or so. Most recently this includes working with the Maurice Wilkins Centre for Molecular Bio-discovery, an expanded collaborative network of scientists, health researchers and providers. The centre will be a catalyst for growing sustainable research partnerships that enhance our work with local communities and scientists from a range of disciplines, to generate new knowledge and better health outcomes that empower our people to live well and live longer. Its activities will offer regular opportunities for our communities (including schools and health professionals) and scientists to share knowledge and co-define priorities, and for Ngāti Porou and other Māori students, practitioners and researchers to develop skills in research of relevance to Māori and rural health. Dr Paratene and his wife Ngaroma lived in Tolaga Bay where he was a GP at Uawa for more than 13 years. In 2006 Dr Paratene initiated the relationship between Ngāti Porou Hauora, our communities and University of Otago's genetic scientists, Prof Tony Merriman and recent PhD graduate Dr Jade Hollis-Moffatt (Ngāti Porou), to improve our understanding, treatment and prevention of gout and related metabolic conditions. Regular hui and wānanga on the Coast was an integral component of this research from the outset, as was the involvement of rangatahi to inspire the next generation of young Ngāti Porou health professionals and scientists. In partnership with Tolaga Bay Area School, Hauiti Marae and the scientists, Dr Paratene also initiated the first of what has now become the University of Otago’s nationwide Science Wānanga Programme with schools and marae. This relationship has continued to develop over the last 12 years into the ongoing 'Gout and Related Metabolic Conditions: Genetics and Environment Research Programme', also involving human nutrition scientist Dr Lisa Te Morenga. And it is now expanding into a research relationship with a national centre for research excellence - the Maurice Wilkins Centre for Molecular Biodiscovery. Paratene was a lifelong friend and mentor to Māori health students and doctors alike. In the 1980s he was asked to inject a Māori element into medical training, mentoring young medical students and encouraging Māori to enter the profession. The University of Otago’s clinical schools in Wellington and Dunedin regarded him as a highly respected leader, great thinker and warm friend. 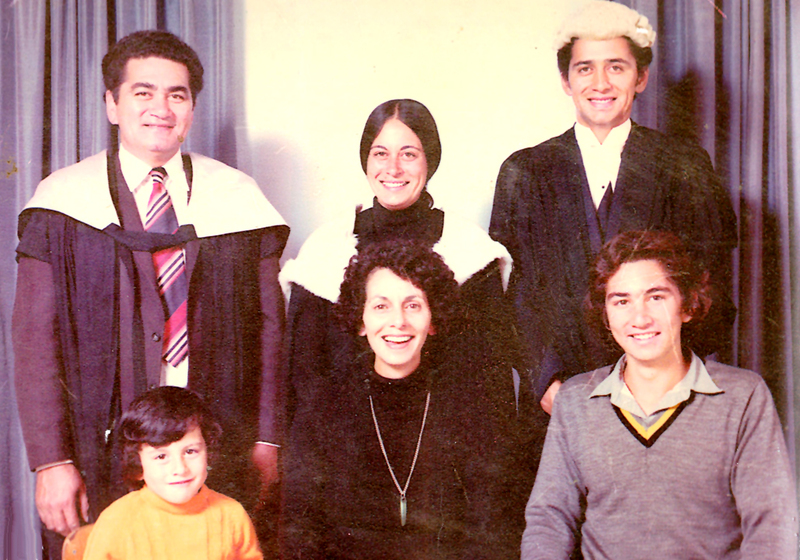 In 1984 Paratene, Eru Pomare and Mason Durie initiated the Hui Whakaōranga, along with George Salmond and Lorna Dyall. The Hui rejected the notion that culture was irrelevant to health. ‘Hauora’ was then established as the relevant brand for Māori health. Dr Pat was given a Ngāti Porou Achievement Award in 2000 and was named Public Health Champion of the Year the same year. He was a trustee of the New Zealand Institute of Rural Health and served as a director of the Midland Regional Health Authority 1991/95. He was awarded an honorary Doctor of Laws in 2004 by the University of Otago and was a Distinguished Fellow of the Royal New Zealand College of General Practitioners. True to style, Dr Pat continued his influence as a change advocate right to the end. He left instructions that, at his tangihanga people wear the white ribbon as a symbol of their enduring commitment to peace and whānau ora. Now is the time to have your say on New Zealand's first set of health research priorities! The Health Research Council of New Zealand (HRC) would like your help in establishing national health research priorities for government investment in New Zealand, the first of ten actions for implementing the New Zealand Health Research Strategy 2017 – 2027. The Strategy charges the Ministry of Health, the Ministry of Business, Innovation and Employment (MBIE), and the Health Research Council of New Zealand (HRC) with increasing the impact of government investment in health research. Consultation has now opened, and your input is being sought on draft Strategic Investment Areas. These will form the overarching 'framework' for the health research priorities. You are also being asked for suggestions for priorities that might sit within this framework. The purpose of this process is to ensure that government funding of health research is better co-ordinated and targeted to address the big issues that New Zealand faces, now and in the future. If you would like to comment, please click here to access the consultation document, which is necessary reading before making an online submission. The consultation document outlines why national health research priorities are being set, who the priorities are for, how they will be funded, and the process for setting them. Meetings are also being planned with the Māori, Pacific and disabled communities in early October in Auckland, Wellington, Christchurch and Dunedin. Keep checking the consultation page on the HRC website, or contact Dr Alexandra Boyle at aboyle@hrc.govt.nz to register your interest. The consultation period closes at 5pm on Friday, 12 October. Please forward this invitation to anyone else in your organisation who may wish to participate. Any feedback that you can give us will be greatly appreciated. Apia, Samoa (July 9, 2018) - Senior Trade Officials from the region will meet in Samoa this week to discuss approaches for expanding beneficial economic activities and coordinating policies to collectively achieve the common economic and political goals needed to strengthen regional trade integration. “The Blue Pacific narrative endorsed by Forum Leaders in 2017 provides a transformative frame to guide these discussions,” said Secretary General Dame Meg Taylor. 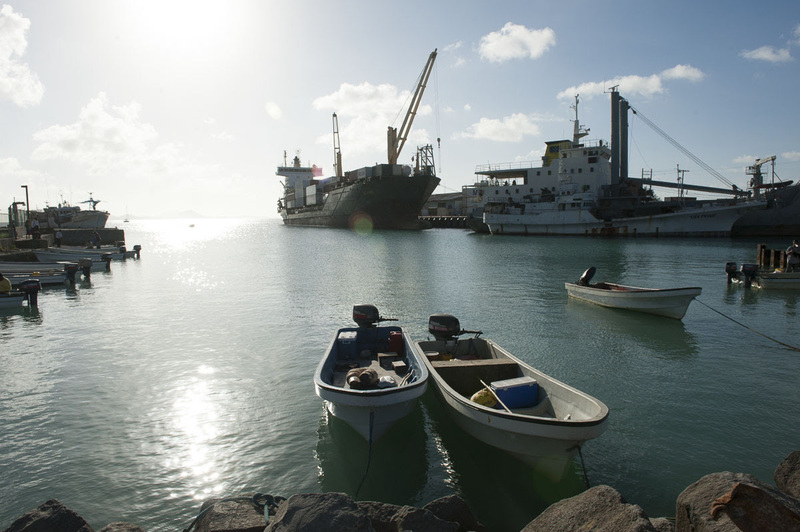 At the request of Leaders, the Secretariat has facilitated the establishment of a Pacific Island Countries Trade Agreement Rules of Origin Committee (PICTA ROC) that will meet today to review and propose modifications to the criteria set out in the agreement through which a product can be conferred an ‘originating product’ status and qualify for access into PICTA markets under the Agreement. The committee currently comprises Fiji, Niue, Samoa, Tuvalu and Vanuatu. A conversation amongst PICTA Parties will be facilitated thereafter on the afternoon of 10 July for views and a way forward on the decision of the PICTA ROC as well as approaches for further deepening regionalism through the inclusion in PICTA of services (PICTA Trade in Services Protocol) and labor mobility (PICTA Temporary Movement of Natural Persons Protocol). The PICTA Parties currently trading under the agreement are Cook Islands, Fiji, Niue, Samoa, Solomon Islands, Tuvalu, Vanuatu and Kiribati. Senior Trade Officials from sixteen Pacific ACP (PACP) member countries will also convene during the PACP Trade Officials Meeting on 10 July 2018 to look at approaches for further strengthening trade and economic relations with the European Union. This will include a discussion regarding Pacific perspectives and priorities for the ACP region’s post-Cotonou negotiating mandate on trade, investment, industrialization and services, including a way forward on the Comprehensive Economic Partnership Agreement. The Forum Trade Officials Meeting follows on 11 July 2018 and includes for the first time French Polynesia and New Caledonia as new Forum Members. With representatives from the eighteen Forum members anticipated to be in attendance, the full membership will converse on collective actions for deepening intra-Forum trade and economic integration in alignment with the Framework for Pacific Regionalism and the Blue Pacific narrative as well as possible mechanisms and indicators to monitor implementation progress. The Meeting will also discuss a way forward on a new Regional Aid for Trade Strategy since its expiration in 2017 and consider progress of the Review of the Pacific Trade & Invest Network (PT&I) Governance Framework. The regional meetings take place at the Tanoa Tusitala Hotel, Apia Samoa, and concludes with a PACER Plus Meeting for Signatories on 12 – 13 July 2018. Until now, New Zealand has never had a unified set of health research priorities at a national level, and therefore not seen the full potential of coordinating its research efforts across the sector. But since the introduction of the New Zealand Health Research Strategy (2017–2027), the Health Research Council of New Zealand (HRC) has been working with the Ministry of Business, Innovation and Employment and the Ministry of Health to ensure health research addresses the needs of all New Zealanders. Key to that success is identifying priorities for government investment to target. The Steering Group for the Strategy, made up of the three forementioned government organisations and representatives from Callaghan Innovation, Universities NZ and District Health Boards, says the purpose of setting priorities is to gain a shared understanding of where to focus effort and resources, in order to get the greatest benefit and value from New Zealand’s investment in health research. Over the course of 2018 and 2019, the Development Group will consult widely and develop a broad set of Strategic Investment Areas, which will be announced in early 2019 and are expected to guide investment activity through to 2027. The Group will continue to refine the priorities, working closely with experts to agree shorter-term research objectives, which will be announced by the Minister of Research, Science and Innovation and the Minister of Health at the end of 2019. The Group will have two Co-Chairs, at least one of whom is Māori. “This is not just about how the Health Research Council allocates its funding, but how the HRC, Ministry of Health, MBIE and other government agencies will work together to form a better and more integrated health research system” says the HRC’s chief executive, Professor Kath McPherson. “There is no end of things to do, but the reality is there are limited resources and a need to make some choices,” she says. Dr Andy Simpson, chief medical officer at the Ministry of Health and member of the Steering Group for the Strategy, says all New Zealanders will be able to contribute to identifying the most important issues for health research to tackle. “This group will help guide that process and so it is great to have such a range of expertise and experience,” he says. For more on the process of setting priorities, visit our Consultation page. Dr Siautu Alefaio, from Massey University’s School of Psychology, speaks on the research she’s about to embark on, regarding how our Pasifika elderly are cared for in the 21st century. Originally posted to the Health Research Council New Zealand website here. The HRC’s director of Research Investments and Contracts, Dr Vernon Choy, says this year’s project proposals once again prove that New Zealand researchers are leading the way in identifying novel solutions to difficult problems. Research in Aotearoa-New Zealand shows the value and importance of Pacific Matua (Elders) in families, churches, and communities. They are not considered separate to one’s family and are the most respected individuals within aiga (family) given their valuable roles as advisors, holders of wisdom and traditional knowledge, protectors of family genealogy and healers of social issues. Caring for Matua within Pacific society is maintained by traditional practices of intergenerational kinship care and multiple systemic living. Migration, new housing, work and living arrangements have created many challenges in maintaining Elder-care. Research remains sparse regarding family, community care and wellbeing of Pacific Matua. However, the Elder population is increasing and numbers are likely to grow rapidly in the next few decades. Drawing on psychology, nursing and social work, a Pacific health-collective approach explores Eldercare practices of Pacific families to understand the health and wellbeing implications borne by carers. The mental health of Pacific young people in New Zealand is a concern. Mental health is included in the New Zealand Health Research Strategy as an area of priority. Thereis no information to our knowledge about the mental health and wellbeing of Pacific students in tertiary institutions. It is estimated that there are at least 30,000 Pacific students in tertiary institutions. This research seeks to obtain information about the mental health and wellbeing of Pacific tertiary students in their first three years at university. We are seeking to determine the risk and protective factors that influence their mental health and well-being. We will explore students’ access to services, their expectations and experiences at University, including barriers to using health or other support services. Furthermore, we wish to determine the role of access to health and other support services on their mental health, well-being and academic progress. This study will assess the effect of a low sugar food and drink policy on a range of important child health and learning outcomes. We will measure BMI z-score, absenteeism, truancy, and student achievement of primary school students from a school that has had ‘water only’ and ‘healthy kai’ policies in place for more than 10 years, and compare these to measurements taken from the two nearest schools with a similar demographic profile but no such nutrition policy. These schools are located in a socioeconomically disadvantaged area of Auckland which is decile 1 ranked. They each have a student population that are comprised of ≥ 80% Pasifika/Māori. A recent study has already shown that this school (that has had ‘water only’ and ‘healthy kai’ policy for 10+ years) has significantly better oral health, with fewer diseased, missing, or filled teeth (DMFT) compared to the eight surrounding schools. Read more about other funding recipients here. Originally posted on Pacific Island Forum site here. As stewards of the Pacific Ocean, the largest of the planet's ocean systems, we have a great responsibility to take up this challenge – for ourselves and for our children and future generations. Originally posted as a Press Release to the Beehive website here. The Coalition Government’s focus on transforming the way we collectively work to improve the lives of New Zealanders by prioritising health, education and housing in Budget 2018 will improve the lives of Pacific families, says Minister for Pacific Peoples Aupito William Sio. Ministers Sio, Sepuloni, Salesa and Finance Minister Grant Robertson spoke this morning at a Pacific community meeting in Auckland to outline how Budget 2018 will contribute towards improving the wellbeing of Pacific peoples in New Zealand. “The significant investments announced for health, housing, education and in reducing child poverty will directly benefit Pacific peoples. These investments are the first steps in our plan to turn around a period of underfunding for these critical public services,” says Aupito William Sio. “Budget 2018 lays the foundations for the future; Pacific people are the fastest growing and youngest population in New Zealand – combined with Maori, our people will play a key role in shaping the future of New Zealand’s economy. “The significant investment of new spending in education with $1.6 billion over four years for schools, early childhood education and 1,500 new teachers, along with the Families Package from 1 July, will all benefit Pacific families. “Our focus on improving access to core health services will also benefit Pacific peoples. The extension of free general practitioner (GP) visits to all under-14 year olds is a significant investment in children. The roll out of lower GP fees for people with Community Services Cards and their children, as well as an expansion in who is eligible for the Card, means that approximately 15,500 more Pacific people will be eligible for very low cost fees for primary health care. “The Government’s multi-billion dollar investment into building public housing and affordable homes through KiwiBuild will benefit Pacific people and help clear a pathway to increase Pacific home ownership. I will be working with my Ministry to ensure that Pacific people are contributing to the solutions being worked on by the Minister for Housing and Urban Development to fix the housing crisis. A new insulation programme for low-income home-owners will make our homes healthier, making them better environments to raise our children. “My Ministry is working hard in collaboration with the Pacific Business Trust and the Treasury to define the Pacific Economy, which we will use as a foundation to build upon to achieve greater prosperity and success in the key pillars of health, housing and education. “The message from our meeting today with the Pacific community highlights that the Coalition Government is committed to improving the wellbeing of Pacific peoples. Budget 2018 is just the start as we build foundations for our future. "That's why in November my Ministry will gather our Pacific leaders - men, women and our young people, to finalise a new Pacific Vision, where we identify specific streams of work that will strengthen foundations for achieving vibrant, prosperous and resilient Pacific peoples in the future, including identifying how to recognise the importance of our languages and cultures and passing it onto future generations,” says Aupito William Sio. Posted by Pacific Rugby Players here. Our ancestors came from across the globe to populate the Pacific Island countries including New Zealand. They were great people with excellent navigation skills, and strong physical and mental stamina to survive the long and challenging voyages. Working collectively as peoples of the Pacific has helped us to survive over the years. We can use similar strengths to fight some of the biggest health problems facing most countries today – chronic diseases such as heart disease, stroke, type 2 diabetes and cancer. Being overweight or obese increases our chances of having these diseases. Fortunately, to a large extent, we can help prevent these diseases in our families and communities. MaiBody, MaiFuture is an initiative that aims to start a dialogue around these issues, providing practical advice from players and access to the best resources to help you on your journey towards better health. Watch some of their stories here (and below). MaiBody MaiFuture feat. Ma'a Nonu from Pacific Rugby Players on Vimeo. We at #WATPO want to send a big thank you to Dr Api Talemaitoga and Executive of the Pacific Chapter of the Royal New Zealand College of General Practitioners for the opportunity to share our research on Pacific family carers' experiences at the Pacific #Health Day on 26 May 2018. We look forward to working with the sector to help improve access and equity for the Pacific Communities we serve! See the day's programme below. The PBRF encourages and rewards the breadth and diversity of research excellence, and its role in strengthening New Zealand and our tertiary education sector. The Quality Evaluation is held periodically (the last one was held in 2012). The results of the Quality Evaluation distribute 55 percent of the fund totalling $1 billion over the six-year funding period. Dr Dafydd Davies, the TEC’s Manager for University Investment, says panellists play a crucial role in the Quality Evaluation by assessing the research portfolios of staff from participating tertiary education organisations (TEOs). “The 13 peer review panels assess the quality of research in specific subject areas and assign a Quality Category to each researcher’s portfolio. For the PBRF 2018 Quality Evaluation, panellists will assess an estimated 8,000 portfolios from 36 TEOs,” he says. So far, 237 panellists have been confirmed for the PBRF 2018 Quality Evaluation. They come from a range of research backgrounds, and have been selected for their subject knowledge and expertise in assessment. The panel appointment process for the PBRF 2018 Quality Evaluation occurs in stages. The first stage closed in September 2015 and included the appointment of chairs, deputy chairs, and an initial cohort of panellists. Nominations for the second cohort closed 26 February 2018 and included the appointment of additional panellists. To ensure an appropriate range of expertise across all panels, additional panel appointments may be made in the coming months. To mark its 25th anniversary, the charity is upgrading and expanding the Port Vila National Eye Centre. Combined with the impending arrival of a Foundation-trained eye doctor, it's hoped the expansion will help increase Vanuatu's eye surgery capacity from 200 to 800 per year. New Zealand's Ministry of Foreign Affairs this week announced it would make a contribution of around $US380,000 to the project. The ministry's Deputy Secretary of the Pacific and Development Group, Jonathan Kings, said the upgrade would strengthen diabetic eye care in the face of Vanuatu's increasing number of diabetes patients. "This facility will serve as a training facility and a primary healthcare site with a focus on diabetic complication," he said. "The Port Vila facility will provide an essential service in the control and management in NCDs [non-communicable diseases] and at the same time continue the work of the Fred Hollows Foundation to build quality eye care systems in the Pacific." Reception celebrating the 25th anniversary of The Fred Hollows Foundation NZ hosted by Their Excellencies, The Governor-General of New Zealand The Rt Hon Dame Patsy Reddy, GNZM, QSO and Patron of The Fred Hollows Foundation NZ, and Sir David Gascoigne KNZM, CBE. Matafanua Hilda Fa'asalele of the NZ Ministry of Health, Hon Dr Saia Ma'u Piukala, Minister for Health, Kingdom of Tonga, Dr Ofa Dewes, Maurice Wilkins Centre for Molecular Biodiscovery and The University of Auckland's School of Nursing, and Dr Paula Vivili, Director of Public Health for Pacific Community - SPC. Noa’ia te’ ne gagaj atakoa! Noa’ia te’ ne gagaj atakoa. Rak’akiof ‘e laloag ne gasao te’ Rotuman Language Week ta. Figalelei ma ‘amis ‘ihua te’ ne aus atakoa se gasao te ma tape’ma se Rotuma Day Celebration e ait te. Greetings, and welcome to Rotuma Language Week. Please join with us for the Rotuma Day Celebrations this Saturday, 12 May 2018, at the Western Springs Garden Community Hall, 10 a.m. – 4 p.m.
Alalum, Faga Fasala, Kijiana Fasala, Rachel Mario, Samantha Nonu, Stephanie Sokra’a, Nik Naidu (Auckland Rotuman Community Group Inc). Congratulations to the Auckland Rotuma Fellowship Group Inc. and their Chairman, Faga Fasala. We are proud of their hard work and achievements and look forward to joining with them in celebrating Rotuma Language Week 6-13 May and Rotuma Day on 12 May. L – R: Ofa Dewes, Falaniko Tominiko, Metua Bates, Tevita Funaki (Chair), Elena Timoteo. Associate Professor Teresia Teaiwa passed away in March 2017, leaving an immense legacy at Victoria University. In accordance with her wish, scholarships will be established to support students of Pacific Studies. Largely organised by the recently formed Pacific Studies Alumni Association, the event featured moving testimony from generations of past and present students. There were performances and speeches from those who cherish their connections to the Pacific Studies programme and are committed to ensuring opportunities for future generations of Pacific Studies students. Dr April Henderson, Acting Director Va'aomanū Pasifika, says Associate Professor Teresia Teaiwa prioritised investing in people. Dr Henderson says that in building and inspiring the Pacific Studies programme, Teresia has created a legacy of pedagogy and content based in knowing and believing in our students and providing them with the opportunities and challenges to realise their incredible capabilities. “We are off to a thrilling start. All of us—staff, alumni, and students alike—were stunned and humbled that by the close of the launch event the fund had already attracted donations and pledges totalling $109,000, including a generous contribution from the Faculty of Humanities and Social Sciences and an astounding bequest of $100,000 from Teresia herself." Help Teresia realise her dream. Your gift is an investment in the future generations of Pacific Studies students. Help us commence our 50th anniversary celebrations with a pōwhiri! This year is a special one for the Faculty of Medical and Health Science, University of Auckland, as we celebrate our 50th anniversary, which is why we want to commence 2018 with a pōwhiri. Open to all FMHS staff and students, the pōwhiri will commemorate where we have come from and what our faculty has grown into - a multidisciplinary faculty with outstanding research and strong links to the community. This is a significant milestone for our faculty and we’d love for you to join us in celebrating it. The pōwhiri will be followed by celebration cake. An inspirational rendition of Golden Globe winning song "This is Me" has been belted out by 400 Kiwi school-leavers ready to take on university. The students, mostly graduates of south Auckland schools, sang the song from the hit "The Greatest Showman" as part of a UniPrep programme at Auckland University of Technology (AUT) South Campus last week. The hit song - which is also in line for an Oscar - is performed on the show by Broadway star Keala Settle, who is of Maori descent and who still has family in New Zealand. This Is Me is from the recent musical release The Greatest Showman starring Hugh Jackman, Zac Efron and Michelle Williams. The 400 school leavers sang in unison with the aid of conductor Igelese Ete. Two soloists were also chosen from the group. The group practiced 'This is Me' for three hours over two days before a final taped performance on Friday. The Joint Scientific Meeting of the Australian and New Zealand Obesity Society (ANZOS) andBreakthrough Discoveries in Metabolism, Diabetes and Obesity is pleased to announce registrations and abstract submissions are now open! The meeting will take place at the Melbourne Convention & Exhibition Centre, from 16th - 18th October 2018. The joint program between ANZOS and Breakthrough Discoveries in Metabolism, Diabetes and Obesity will be featured in the first 2 days focusing on the latest developments in the Basic Sciences, lead by a host of international and national experts. The Clinical Sciences and Public Health streams of ANZOS will run throughout the 3 day meeting and the usual ANZOS Basic Sciences stream will continue in its own right on the 3rd day. We are delighted to welcome National Eye Health Coordinators (NEHC) to the International Agency for the Prevention of Blindness VISION 2020 Workshop hosted by The Fred Hollows Foundation NZ, a well-respected non-governmental organisation working tirelessly towards a vision of a world where no one is needlessly blind. NEHCs are integral to the development of eye health systems in developing countries (such as those in the Pacific region) and to the advocacy efforts of IAPB, as well as the World Health Organization and its member agencies. The invite-only workshop is being held at the University of Auckland FMHS Grafton Campus from 30 January to 1 February 2018. The new year is well underway at the Health Research Council, and a particular focus in coming months is on bringing the principles of the New Zealand Health Research Strategy (NZHRS) to life. The NZHRS sets out the Government’s vision that by 2027 New Zealand will have a world-leading health research and innovation system that, through excellent research, improves the health and wellbeing of all New Zealanders. The HRC is working closely with the Ministry of Health (MoH) and the Ministry of Business, Innovation and Enterprise (MBIE) to implement the Strategy, and to develop an inclusive process for setting national priorities for health research investment in New Zealand. The HRC has reviewed a number of national and international approaches for setting priorities and is discussing a preferred approach (incorporating the best features of many of these processes) with MBIE, MoH and others on the Implementation Steering Group before consulting more widely. The detailed feedback from around New Zealand that was provided during development of the Strategy has been invaluable in guiding the present work we're doing. Over the coming months there will be opportunities to participate in this process as we seek additional input from a broad range of stakeholders in the science, health, and innovation sectors. We congratulate Dr Ofa Dewes who has been appointed Chair of the Pacific Health Research Committee after serving on the committee for a year. We're also grateful for the input of Dr Palatasa Havea, who decided to step down as Chair but will remain as a member of the committee until his six-year term ends in December this year. Ofa Dewes is an Affiliate Investigator of the Maurice Wilkins Centre for Molecular Biodiscovery, and Research Fellow at the School of Nursing, University of Auckland. Among her many projects, she is currently leading research into older Pacific people's experiences in palliative care, as well as researching the differences in fructose absorption among Pacific adolescents. We also welcome Dr Dianne Sika-Paotonu as a new member to the committee. She is Associate Dean (Pacific) of the University of Otago, Wellington, and Senior Lecturer of the university's Department of Pathology & Molecular Medicine. Her research interests include immunology, acute rheumatic fever and rheumatic heart disease, immunogenetics, cancer and pharmacology. Ms Marisa Maepu, Manager of the Ministry of Health's Pacific health policy team, is also joining the committee, replacing Hilda Fa’asalele. Marisa Maepu has led the development of various government strategies and policy advice to ministers, and has vast experience working with Pacific communities. Finally, we welcome our new Pacific representative for the Public Health Committee, Dr Jemaima Tiatia-Seath. She is the Acting co-Head of School and Head of Pacific Studies, Te Wānanga o Waipapa, School of Māori Studies and Pacific Studies, University of Auckland. She is currently leading research projects into Pacific suicide prevention and postvention, and has research interests in youth development, Pacific health and wellbeing, and inequities in health. According to the World Health Organisation, cancer is a leading cause of death globally, accounting for 8.8 million deaths in 2015. In other words, nearly one in six deaths is due to cancer. The most common causes of cancer death are cancers of lung, liver, colorectal, stomach and breast. In 2012, there were approximately 14 million new cancer cases worldwide, and the number is expected to rise by about 70% in two decades. The economic impact of cancer is significant and is increasing. Foreseeing an escalating prevalence of cancer locally and globally, the Nethersole School of Nursing of the Faculty of Medicine at The Chinese University of Hong Kong organised the 1st Nursing Symposium on Cancer Care in 1999. Since then, the conference has become an important nursing event contributing substantially to the promotion of quality cancer care in Hong Kong and beyond. The theme of the conference this year is ‘Composing future symphony of cancer care through collaboration, innovation, and transformation’. By pooling the efforts of nursing and healthcare professionals, policy makers, academics and researchers from around the world, this conference aims to examine strategies and initiatives to achieve collaboration, innovation and transformational development in cancer care in local and global contexts. Keynote and plenary speakers invited to the conference are internationally renowned experts in the healthcare field. Their experiences and insights will stimulate dynamic discussions on innovative strategies and collaborative approaches for the delivery and promotion of cancer care. There are also concurrent sessions for delegates to dialogue on a wide range of theme-related topics, facilitating transformational development of cancer care for the health and well-being of all mankind. Hosted by UQ’s School of Public Health, in collaboration with UQ International Development, Abt Associates, TNC Pacific Consulting and the Centre for Policy Futures, the workshop aims to facilitate a meeting of scholars and practitioners from Australia and the Pacific region who work on issues related to health, governance and development. The workshop will explore the health and development of the region within the context of the unfolding UN Sustainable Development agenda. The event is designed to map research needs for the region in terms of four major themes, with the objective to facilitate the construction of research agendas for policy by means of co-creation activities. The workshop will be the first in a series of events designed to broker networks and partnerships for research and innovation for health in the region. Workshop organisers and sponsors have set out to organise an event that is deliberately different from standard conferences. An emphasis has been placed on seeking funding for travel scholarships to bring Pacific voices, scholars and practitioners to the event in order to construct research agendas that are Pacific-driven, respond to needs and create agendas for joint research and action. Keynote speakers, panellists and chairs will include leading scholars and practitioners in Pacific affairs and global health governance, with space for dialogue and an opportunity for researchers, funders and practitioners from the region to discuss research needs and collaboration opportunities. One component of the Conference will be a session devoted to mitigation action under the Paris Agreement on climate change. Representatives of nations across the Pacific will be asked to report on steps being taken at the national level to reduce greenhouse gas emissions to slow the rate of climate change. The Pacific Climate Change Conference will start in the morning of Wednesday 21 February and will run until the afternoon of Friday 23 February. This will give you the opportunity to continue your experience in Wellington at the free New Zealand Festival event "Kupe: Festival Opening Night", which will start at 7 pm on the Taranaki Wharf, Wellington. strong communication, emotional intelligence and authenticity. Don't miss this opportunity offered by TECNZ to serve on a panel for the Performance-Based Research Fund 2018 Quality Evaluation. You can nominate someone until 26 February 2018! For more information, view the flyer below or click here! Memories are complex, selective, and evolve over time. Some memories are hegemonic and powerful and some are subordinate and marginalized. This conference seeks to address the complex politics of cultural memory in the Pacific from a variety of critical perspectives. Check-out our abstract below, which will be presenting the 30 November. The tradition of storytelling in the Pacific has been around since the first Pacific peoples. Storytelling is a way to preserve history, and with that, memory. Memories are beautiful because in a sense, they keep a person's spirit and culture alive, allowing that presence of the senses to pass back and forward in time, throughout generations. As technology has evolved over the years, the ability to preserve these memories through sound, photographs, videos, and digital stories has as well. We use the media of digital stories to record the memories of loved ones lost physically in and to the Pacific community but remembered in spirit, to ensure the survival of the cultural custom of storytelling. For most individuals, growing old is an accomplishment, that one has lived a long life, and so it is necessary to address current issues among our older Pacific people. As governments have called for programmes and policies that shift palliative care into the community, and in an attempt to better understand the nature of the relationship between Pacific family carers and the older family members they cared for at end of life, we have created digital stories in collaboration with Pacific caregivers. This form of media was chosen because of the ability to combine the power and personal connection of the storyteller’s own voice along with powerful images and video of their loved ones. This subject, although very private across Pacific communities, is necessary to call to action because of the support it gives others in similar situations, an awareness of current issues faced by family carers , and to let our older adults know that we honor and value them for their love and service to family and community. Our digital stories are an addition to the current research Tāpinga ‘a Maama: Pacific Life and Death in Advanced Age led by Dr Ofa Dewes, and funded by the Ministry for Business, Innovation and Employment through the National Science Challenge for Ageing Well. The findings of this research will be released later this year. Join us for our 2017 annual conference! Mark your calendar and join us for our annual conference on 3 November at University of Auckland Tamaki Innovation Campus. See the link below for more details!